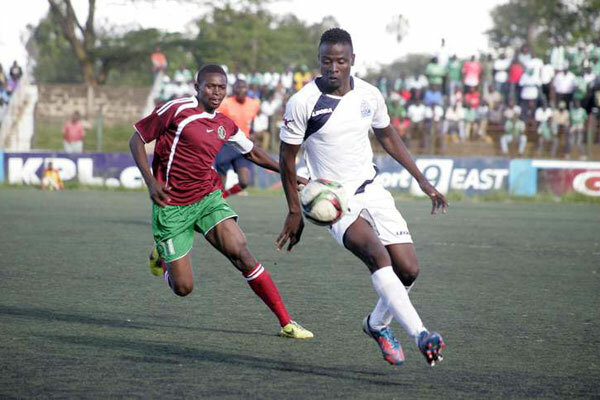 Gor Mahia beat Administration Police 3-1 in an entertaining GoTV shield match played at City stadium. George Odhiambo “Blackberry” struck twice in the first half and Meddie Kagere added a third late in the game. In the process Gor Mahia kept their hopes of winning all four domestic trophies on offer alive. George ‘Blackberry’ Odhiambo grabbed a double with Meddie Kagere scoring late on for the Kenyan champions to down the hard fighting law enforcers, who had threatened after second half with a consolation from Salim Mzee. Gor Mahia will now face Nakumatt FC in the semis with the winner setting up a final with Bandari FC. K’Ogalo started the match as favorites considering the fact that the team had many experienced players with unmatched form this season, but Administration Police also had a record to be proud of having eliminated Sofapaka in the knock-out phase. Michael Olunga started from the bench with Abouba Sibomana fit enough to be given a run alongside Godfrey Walusimbi, Collins Okoth and Karim Nizigiyimana, who were tasked with international matches in the last ten days or so. The Division One side showed what they are capable of, scaring in the early minutes of the game, with the dangerous Webale missing to hit the target twice within the first ten minutes with Ernest Wendo trying hard to justify his inclusion in the team in place of Olunga. owever, it was George Odhiambo, who struck in the opener in the 18th minute, as his shot beat the opponent’s custodian in the near post, after AP had wasted a glorious opportunity to take the lead three minutes earlier. The goal gave the hosts much needed confidence, pinning the inexperienced Police in their own yard, with the latter relying on counter attacks to unlock their opponent’s defense. With Meddie Kagere, Ali Abondo and Ernest Wendo wasting chances, it was ‘Blackberry’ Odhiambo again, who rose to the occasion almost ten minutes to the break, as he cut in from the left, leaving defenders for dead before unleashing an unstoppable shot past the goalkeeper to double the advantage and ensure the first half ended with his team on top. The second half saw a determined AP side pressing for an equalizer, with the Green Army also creating a number of chances with neither side clinical to finish them off. However, in the 58th minute, Salim Mzee took advantage of Jerim Onyango’s wrong positioning to place the ball well far from his reach to half the scores. That goal turned out to be a consolation however, as the team failed to beat the league champions defense to get an equalizer, with Kagere adding the team’s third late on in the game to ensure K’ogalo sets a date with Nakumatt in the semi-finals. The best thing with gormahia everyone is doing his best n the only thing that stand against gormahia is lack of finances to enable it reach CAF Quarters because locally I don’t see any team that will challenge gormahia. @stadia view, your views on sponsor is misplaced.our problem is lack of accountability in the office. Which sponsor will give gor mahia money without proper books of accounts and lack of transparency. Gor Mahia need proper internal processes to be put in place in order to attract sponsors. @Dan Original, if a sponsor is to come and wants to verify the books of account, I can tell you that they will run away because Gor Mahia do not have such statements in place. We need to be serious with ourselves. We have a deep problem in sports administration in Kenya and there s no serious sponsors that can come due to lack of basic information on the financial status of the sports institutions. It is only KPL that have such essential information. Sports n Kenya are run like jua kali business and officials are the great enemies of the development of sports in general. There is no sponsors that can associate with this mess and that is why we must now embrace Sports Act and make all sporting institutions to be accountable. We should not hid our heads in the stand that it is hooliganism, political etc which are deterring potential sponsors. It is lack of accountability which is killing the beautiful game from FKL to all clubs. Why should Safaricom associate with moribund bodies with no accountability? Does Gor Mahoa have audited accounts? Have the accounts been published to the public as public is one of the stakeholders? EC has done very well in winning trophies and we commend them for these broad achievements under the stewardship of Ambrose Rachier. For this broad achievement, I can award the executive with 98% for this mandate but give them 0% for lack of accountability. Is Wafula on leave or injured?